The rest of our trip on Andromeda was fairly uneventful. Frede’s team had attempted to get a scan on the escaping ship; however, it had cloaked itself before they were successful. We had compared notes with Detective Luck A. China, but after a thorough exploration of the Two Guys’ apartment and office, we were without any other clues besides the flyer from Sierra Planet. 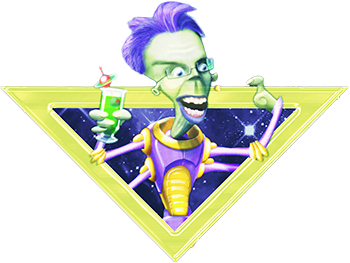 Our group of adventurers were now back on Tawmis’ ship, with the new additions of the Space Quest Historian, Bill Grig, and the Historian’s android, Chrono-2012. Detective Luck A. China did not have the jurisdiction to explore outside of Andromeda without getting permission from the Andromedan government, which is why I suspected the Space Pope had chosen a group of fans who could move freely from world to world in the Sierra Community galaxy and weren’t blocked by government red tape. We were now on our way to Sierra Planet. I sighed, standing on the deck of the ship, watching the stars fly by and wondering what would be waiting for us when we arrived. It had been a long time since I had hung out there for an extended period. I had popped in for brief visits, but it had been my home for several years and was once one of the main hubs of the King’s Quest community. “Everything all right?” A voice said behind me. I turned to see Bill standing there, his characteristic blue beanie visor pulled up far in the front of his face, almost to the point where you really couldn’t see his eyes. “Are you excited about going back?” he asked me. I looked up at the stars, realizing that we had to be soon arriving as I recognized several of the constellations. Sure enough, Serena’s voice came over the loudspeaker requesting everyone to meet on the center of the deck. Bill and I walked over, the rest of our group joining us. “Well, you guys have fun bowing and curtseying for all the lords and ladies of court,” the Space Quest Historian said. “Actually, we selected you to accompany me to the planet,” Serena told him. “Yeah, but still, unless you’re going to be talking about bad acting and over the top plots in a horrible game, I don’t think I’ll be of much help,” the Historian argued. “Well, as long as I don’t have to deal with any annoying talking owls, I guess it’s all right,” the Historian replied. “But you’re coming with us, Chrono!” he added, looking over to his personal android. Estir and I nodded. I had figured Serena had wanted me to come along with my background, but I knew I would need to make sure she was aware of what my presence meant for this mission. No one could think of anything, so the meeting broke up. Audio Dane came up to Tawmis and informed him that we had arrived in the Sierra Nebula sector, where Sierra Planet was located. We got into a shuttlecraft and departed from the ship, slowly getting closer to the Sierra Planet Castle. Jessie had already spoken to Kat about our arrival, so we would not be coming unannounced. Within a few moments we landed outside of a castle, which resembled Castle Daventry from the Kings’ Quest games. Since Sierra Planet had been inspired by Roberta Williams’ game catalog, many of the planet’s locations had been taken directly from various games. Jessie thanked him and we were soon ushered into the main courtyard around the castle. What had once been a busy bustle of people coming and going was much smaller now, the few quiet groups left pulled at my heartstrings. I saw Lady Abigail, Sister Susan, and Duchess Tomato chatting on one side of the courtyard. At one time you almost certainly would have seen Sir Templeton walking around on patrol. Ugarte and Mademoiselle Meena from Heroiana would often be spotted here, as well as Akril from Andromeda. But nowadays, the courtyard was a shade of what it had once been. We made our way towards the castle in the center of the courtyard, passing a statue of a young woman. “Who’s that?” Estir asked. I looked at the statue, a new addition since I had lived here long ago. Kimmie had still been Empress at that time, although I had left shortly before her retirement. Kimmie was actually the one who started me collecting Sierra games in the first place, so if it hadn’t been for her, I would never have been invited to the Sierra Collector’s Guild. We arrived at the castle and made our way past the guards. We were met by Von Pookie, one of Queen Kat’s advisors. “Please, follow me,” she said. We made our way down the beautiful hall to an elegant throne room. There were several smaller groups of thrones around the large one in the center. I, of course, recognized everyone in the room: Lady Rini, Good Sir Kiwi, and Jessie’s sisters, Princesses Kristin, Desa, and HorseLover. Queen Kat II sat in the throne in the center. “Jessie, you’re back!” Kristin said, getting up to give her sister a hug. Desa and HorseLover followed her and the four were soon engrossed in a hushed conversation. Jessie quieted her sisters and pulled away to stand next to Serena. Kat smiled. “You don’t have to stand on such formality here, Serena,” she said. “Believe me, we’re a pretty laid back court.” Her eyes turned to her daughters, who all giggled nervously and returned to their seat. “Hey Josh,” Kat said and she saw me. I could tell she was resisting the urge to run up and give me a hug. “It’s always a pleasure to see you, Kat.” I replied with a smile. Due to the formalities of everything going on, as well as the large group of people, I knew this was neither the time nor the place for us to catch up and chat. Kat nodded, indicating she understood this as well. “So, what can we help you with here on Sierra Planet?” Kat asked turning back to Serena. “Well, as you no doubt know, the Two Guys from Andromeda have been mysteriously kidnapped,” Serena said. “We’ve been following them, and we found this flyer of evidence which showed us that they might be here.” She took out the flyer we had found on Andromeda and handed it to the Queen. Kat looked it over, a confused look on her face. “We’re not sure,” I said, “But who or whatever it is, they have a ship that can move pretty fast and cloak,” I told her. A pensive look crossed her face. “You know, I had heard that there were reports of a strange spaceship that landed near New Tamir recently,” she said. “I can arrange for a carriage to take you there immediately,” Queen Kat said. “Thank you so much, your maj….er, I mean, Kat,” Serena responded.